Christopher Fenoglio writes about movies, music, sports, and other popular culture that inspire one’s daily faith journey. His recent book THE SECRET OF THE SANTA BOX helps parents inspire their children from a magical belief in Santa Claus to an inspired understanding of the true meaning of Christ. This beautifully illustrated Christmas poem is based upon the actual method he and his wife Linda used when talking to their three children about Santa Claus. The book was published by Treehouse Publishing Group in 2017 and is available here. A graduate of the University of Notre Dame, Fenoglio has served in numerous editorial, production and marketing positions in the Christian publishing industry for more than 30 years. For six years he wrote the “Reel Life Journeys” columns for The Tennessee Register, the newspaper of the Diocese of Nashville. These columns explored the inspirational and spiritual themes found in films, faith and family. His columns were honored numerous times by the Catholic Press Association, including First Place designations for Best Regular Column for Culture, the Arts and Leisure in 2009 and 2010. In addition to The Tennessee Register, Fenoglio served on the website, marketing, and editorial staffs for CCM Magazine and The CCM Update. For three years he was the editor and publisher of New Catholic Books & Media. He currently the managing editor of the denominational website for The United Methodist Church. In the late 1980s, Fenoglio and friend Mary Corby recorded three cassette albums of Christian hymns: “Ave Maria and Other Songs of Devotion,” “O Sanctissima and Other Hymns of Praise,” and “Emanuel – The Music of Christmas.” In 2004, Fenoglio digitally remastered the Christmas album and re-released it on CD. A former baritone in the Notre Dame Glee Club, Fenoglio currently serves as a cantor and music minister at St. Henry Church in Nashville. He enjoys singing the National Anthem at all kinds of events, especially at games and sporting events. 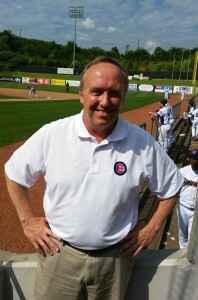 Fenoglio has sung the National Anthem at all of the current ballparks affiliated with the Chicago Cubs, as well as for the Vanderbilt Commodores, Nashville Predators, and the Tennessee Volunteers. Read more about Singing 4 the Cubs and watch videos of the performances at all of the ballparks here. You can see additional photos at the Singing 4 the Cubs page on Facebook.